Real Madrid started the last stage of this pre-season preparation and arrived today to China, to play two more friendly matches against Chinese teams Guangzhou Evergrande and Tianjin Teda. Cristiano Ronaldo and his team mates had thousands of Chinese fans awaiting them in the Guangzhou airport, but CR7 was definately the most popular among the fans. Real Madrid arrived this Sunday to Guangzhou, in China, where they have scheduled two more friendlies, to be played against Chinese teams Guangzhou Evergrande and Tianjin Teda. The Merengues landed in Chinese soil, under strong security measures and the main "target" for the Chinese was unsurprisingly, Cristiano Ronaldo. CR7 is very popular in the Asian continent, and that's not something new, since Ronaldo used to experience this sort of warm welcoming while still playing in Manchester United and visiting Asia in pre-seasons tours, but this time, his presence in China is driving many fans absolutely crazy. 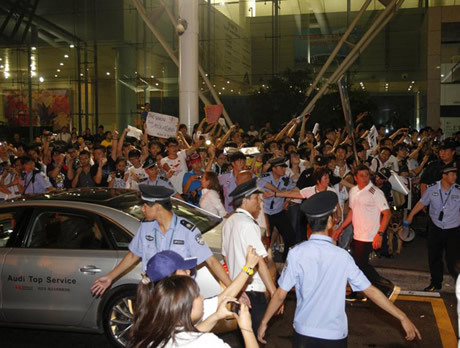 More than a thousand fans were waiting for Real Madrid squad to land in the Guangzhou airport, but they'll have to wait for tomorrow to see the first team pratice. Cristiano Ronaldo and Real Madrid will stay in the Sheraton hotel, in Guangzhou and will have their first training session tomorrow morning. There's still one player missing in Real Madrid squad and that's Angel Di Maria, who just married last Friday and is only expected to join the team later this week.